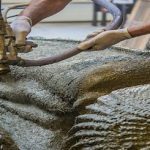 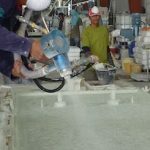 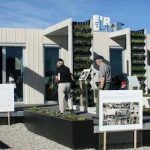 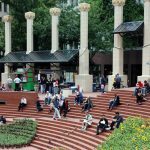 With rapid developments in 3D printing, it is not surprising to see a installation that utilizes 3d printing to create concrete molds. 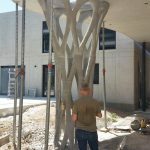 A recent project project by XtreeE, from France, is an organic truss-style support structure cast from ductal concrete. 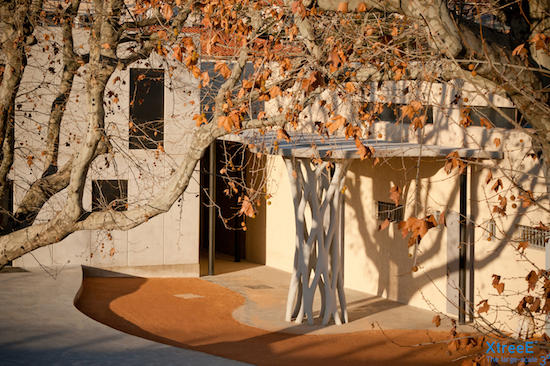 This framework support is part of the entrance to a preschool in Provence. 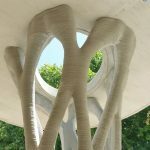 The project was designed by Marc Dalibard, XtreeE was the brainchild behind the concrete column process. 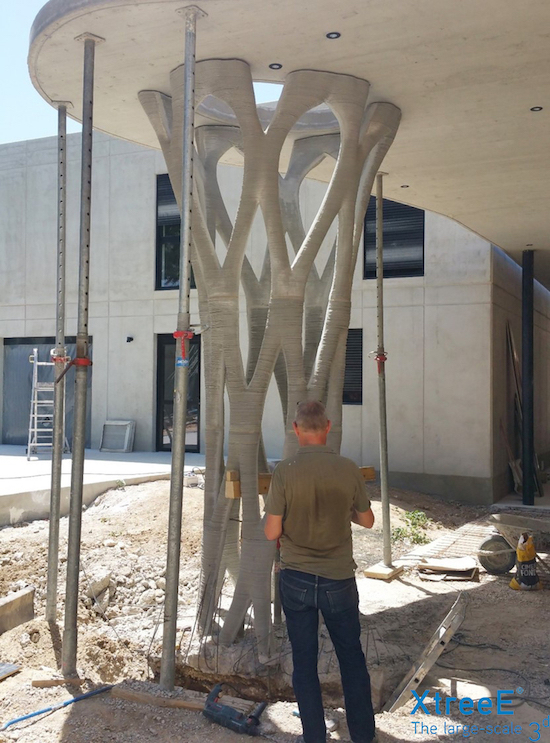 The finished pieces are13 ft tall and match the concrete of the preschool building. 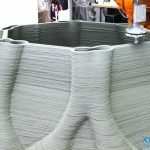 To create the structure, XtreeE programmed an industrial robot arm to extrude a special mixture of concrete to form the “envelope,” or mold, of the organic structure. 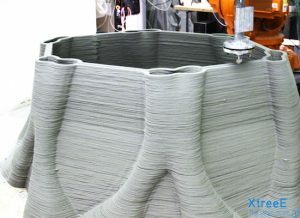 This printed layer functions as the outer and inner mold components. 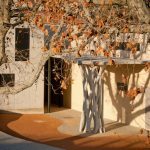 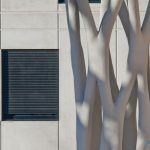 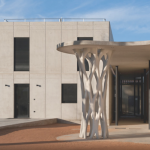 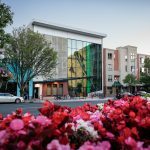 The hollow envelope was then filled with LafargeHolcim ductal concrete and filled to remove the appearance of each printed layer, creating a smooth surface that calls to mind the twisted roots of a tree. 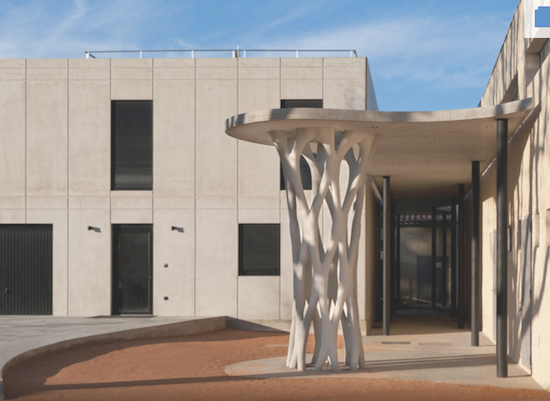 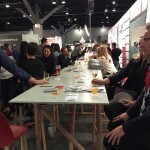 The structure was printed in segments at the XtreeE studio and then assembled on site. 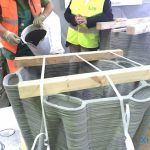 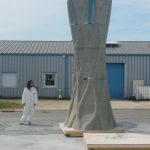 The printing process alone took over 15 hours–however, once the print program is written, it could in theory be used to produce a large number of identical concrete supports with less human labor than traditional methods. 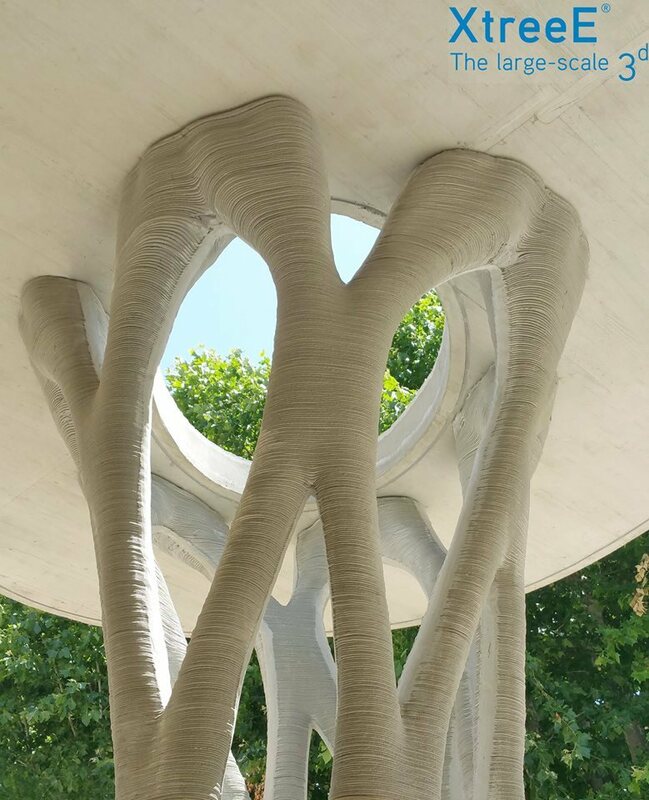 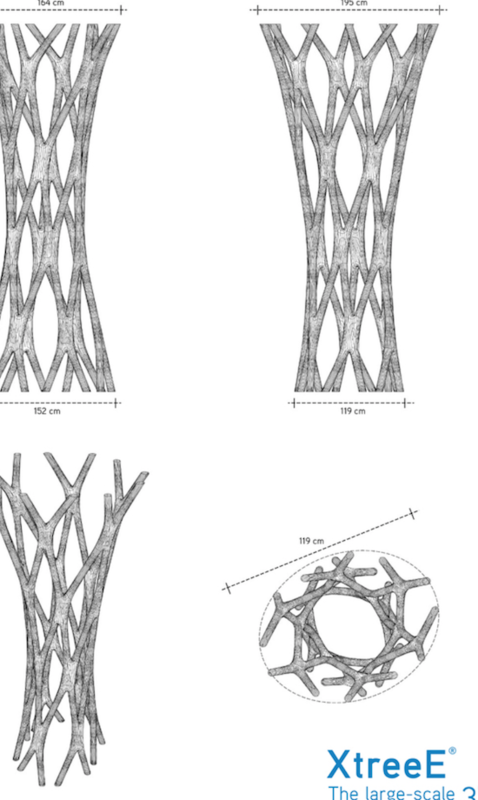 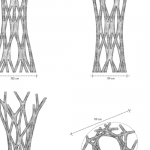 After the final geometry was designed by topological optimization, it was divided in four elements for prefabrication. XtreeE’s team then generated the tool-paths and 3D-printed the envelope. 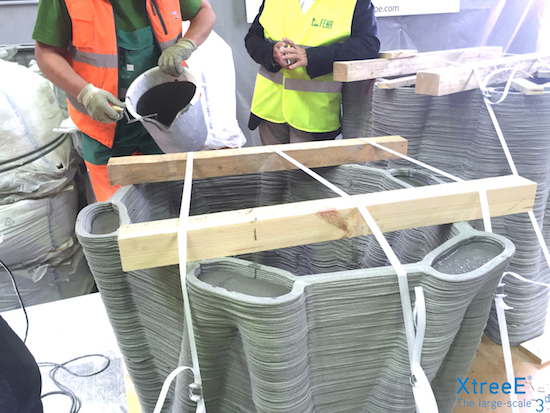 Concrete was then poured into the envelope and the elements of the post were assembled. 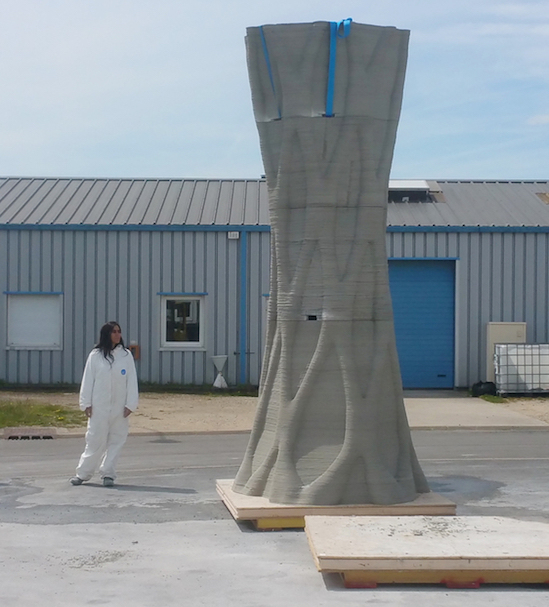 The post was then installed on site and patched to remove the 3d printed mold tooling lines. 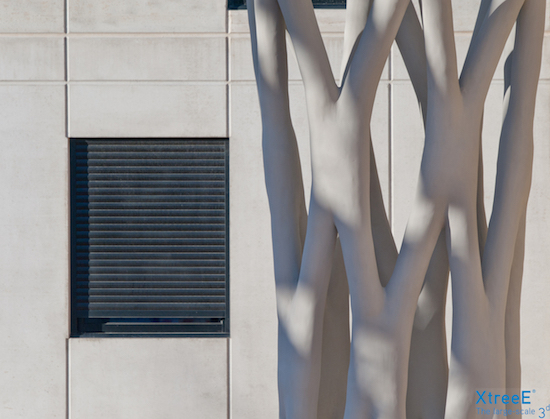 The final step was to polish out the 3d tree branches, which left a smooth, natural looking finish.